North Bound or South Bound? The following information is intended as a guide to walking the PCT as well as what equipment you can take with you. The advice is given in the understanding that it is, advice. You are responsible for your own well-being in the outdoors, check your facts, know how to use your equipment and how to deal with outdoor situations. I accept no responsibility for the advice or information given here. 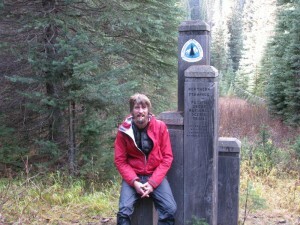 The Pacific Crest Trail stretches some 2,650 miles from the Mexican border to Canada. It meanders through the scorching deserts of California, the dramatic Sierra Nevada Mountains, the volcanic landscape of Oregon and the vast forests of Washington. 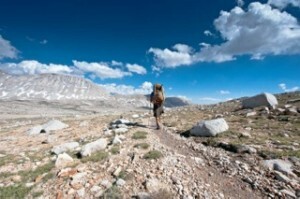 In 2010 when I hiked the trail around 300 hikers attempt to walk its entirety and the success rate was only about 20%. Now it’s closer to 1000 starting and a 50% finishing. Out of every ten who start, four will give up in the first month alone and only two will reach Canada. Extremes of heat and cold, the toughness and roughness of the trail and encounters with an assortment of potentially deadly creatures stretch walkers to their absolute limits. Take it on and there’s a very real chance that you won’t make it. Good research is a must, know what you’re up against and plan accordingly. Know what equipment you’ll need for each section, what to eat, what to expect and you can increase your chances of success. I hope the following helps you out and if you do decide to take on the PCT, the very best to you. Towards the end of April every year most thru-hikers congregate at Lake Morena campground for this gathering that is not to be missed. Many previous thru-hikers, section hikers, gear manufacturers, volunteers, speakers and a variety of other hiker associated individuals also gather here to soak up the atmosphere. The exact date is announced on their website some weeks before and coincides with the optimum time to start a thru-hike taking into account snow levels in the Sierra. It is usually the last week of April. Registration is necessary to get in and the process usually opens early March. You can do this on their website and it is camping only. The nearest airport is San Diego, which is 56 miles from Lake Morena. If you’re driving, go east on Interstate 8 for 46 miles to Buckman Springs Road. Go south 7 miles to Oak Drive, then west 2 miles to Lake Morena Drive, straight to the park entrance. If you do some checking around you should be able to get a ride in with one of the trail angels who live in the area, see here. 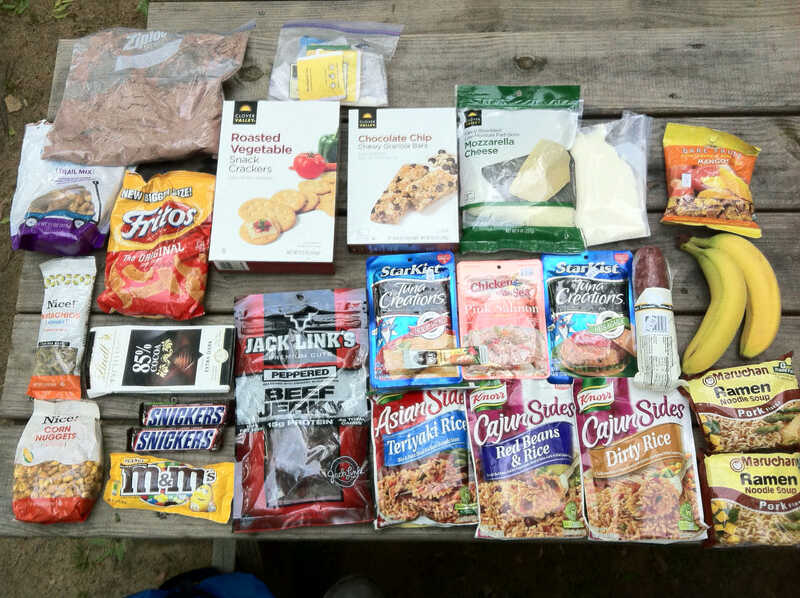 If you’re a thru-hiking virgin then the best bit is that all the food is free! Get yourself into practice for the coming months where you will trying to catch up with your energy expenditure. The KO is not to be missed, you’ll meet loads of people, as well as those you will meet on the trail and ask all the questions you like, there will be many willing to help you out. The PCT is physically demanding and geographically diverse. It is a mix of many landscapes and environments. Hikers work their way through 3 States; California (1703 miles), Oregon (452 miles) and Washington (501 miles). Don’t be intimidated by the word. The correct description is chaparral. This is not an area that may spring to mind of nothing but miles upon miles of sand and little else. It is more a surface of fine grit, stones and rock. Temperatures will reach 100F although there is little humidity. It is a baptism by fire but geographically it is not too demanding. Plant life is abundant, especially when thru-hikers start around late April. It is not too remote and there are plenty of chances to re-supply and get off trail to clean up. Wear light, easy fit clothing with a light colour. Darker colours absorb more heat. Make sure you wear a hat that will keep the sun off your head and preferably your neck also. A sahara hat is ideal (a baseball cap with a neck guard that hangs off it). Many hikers wear long sleeves and trousers to keep the sun off. Sunscreen is a must on any exposed skin. California has more than its fair share of critters. Scorpions, snakes, spiders and mosquitos are all prevalent. Shake your shoes before you put them on, take insect repellent and give snakes a wide berth. The main species is the rattlesnake which will usually let you know it’s location by rattling. Simply give them a wide berth and you’ll be OK. More info on the wildlife under the dangerous wildlife section near the bottom. Water is the one resource you cannot afford to ignore. I got through most days with four litres for actual drinking, not including cooking and camp supply. Some people drank much more, you’ll find out soon enough how much you’ll need. Sources vary from year to year according to how much rainfall California has received over the winter months but save a few sections, it is fairly readily available. You will need to plan between locations by checking your maps and water supply reports. Be warned there are some sections where you may have 20 or more miles with no access. Water reports can be found here. Very possibly the best section of the entire PCT. Jaw dropping scenery, an abundance of water, massive elevation changes, the Sierra Nevada is a work of wilderness art. It can also be dangerous if you’re not prepared. The Sierras start pretty much at Kennedy Meadows, just over 700 miles in. Before that it’s dry, hot desert, and then you climb into crisp, fresh mountain air. This is high mountain country, there are numerous passes to negotiate, bears, the start of the mosquitos , and although not technically difficult, you should be comfortable traversing snow and ice. A beginner’s winter skills course would be advisable. You will need to send equipment to Kennedy Meadows Store for this section. Namely: Ice axe, crampons or similar, warmer clothing and a bear canister. I met no-one carrying a rope, you wouldn’t really need it. The Sierras go up to a maximum altitude of 4023 metres (13200 feet). This is well into the elevation where altitude sickness or acute mountain sickness (AMS) can strike. Around 2500 metres (8200 feet) is generally considered to be the start of the danger area. Hopefully you won’t encounter any problems because you have spent 700 miles gradually increasing your elevation. However, you should know the signs; headache, fatigue, bad stomach, dizziness and sleep disturbance. Ignore it at your peril, it can kill. The solution, thankfully, is simple enough. If you have mild symptoms you can ascend but do so gradually, steadily and do not exert yourself more than is necessary. If your symptoms are more severe, stay at your current altitude to let your body adjust. If your symptoms do not get better (or they get worse), descend to a lower altitude. If you have not acclimatised, for whatever reason, do not increase the altitude from where you slept the previous night by more than 300 metres (984 feet). See the health section for more info or look here. Take more food, you will need it. I craved sugar in the mountains more than anything. Because you are working harder in a cooler environment you will burn more calories. Watch your re-supply also, there are not many places to get out of the Sierra so you will need to plan accordingly. It is worthwhile taking an extra days food over what you think you will need. Your cooking fuel will also deplete quicker because of the cold and elevation, take a little extra. Hikers breathe a sigh of relief when they hit this state. Firstly, it seems like you have been in California for an eternity. California is 1700 miles long and it’s a big morale boost to get into another state. Oregon is also kinder hiking terrain. The elevation loss and gain is less severe, but by no means that easy and you’re out of the mountains so it’s warmer. There are more chances to re-supply and some great towns to relax in. Depending on how long you have taken to this point, you may encounter the occasional bout of wet weather but in general you should stay dry. Oregon is predominantly forest which warms you up for Washington where forest is the name of the game. Use the state to increase your mileage if you like and claw back any lost time if you are behind schedule. Back to more severe elevation changes, Washington is a beautiful area to walk through. Heavily forested with ample opportunities to stock up on water, you are on the final leg here. Chances are you will get rained on despite how good your progress may have been and you may even get snow in late September onwards. The final section through the Cascade Mountains should not be underestimated. Once you hit the famous monument 78 marking the end of your thru-hike, there is still another 8 miles over into Canada where you hit a highway and Manning Park. The lodge is pretty good and they give a decent hiker discount, you can get a meal at the restaurant. They Greyhound bus stops here every morning providing onward to transport to the nearest city, Vancouver and other destinations. Lightweight equipment has come along leaps and bounds in the last ten years. It doesn’t have to be heavy to last the distance, some of the lightweight materials and construction out there are bomb proof. There are numerous areas to save weight. 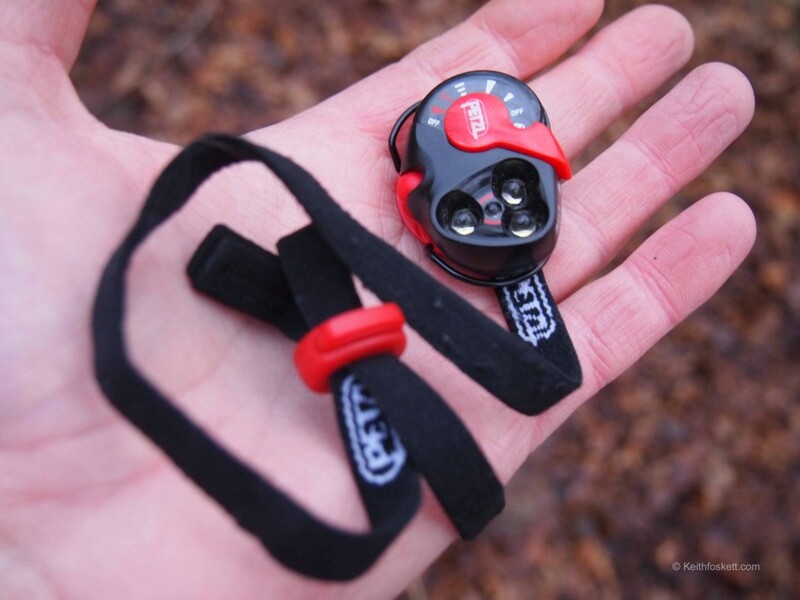 A basic Petzyl E-Lite head lamp weighs 27 grs and is all you need. Take even a simple pen knife. All you need is a blade and scissors (and of course a bottle opener!) Make a lot of small differences and see your pack weight come down. You can double up the uses for some items. For example, if your hands get cold and are still cold in your gloves then use your spare pair of socks as well. The four areas where you can make the biggest weight difference, and where you should choose wisely, are; rucksack, tent (if you take one), sleeping pad and sleeping bag. It is now entirely feasible to get all these big four under 2134 gr, that’s 4.6 lbs. And, these are not the lightest. Concentrate on the big four and it will pay dividends. This is my complete equipment list for my thru-hike, bear in mind this was in 2010 and a lot of this equipment has now been superseded, or not even available anymore. Although some items had to be replaced, this is what I started with and pretty much had for the entire hike. Having walked the PCT and become used to my gear there are some items I would now leave out. You’ll get used to what you do, and do not need. Weights are given after each item (ounces / grams). Also bear in mind that my thru-hike was in 2010, equipment changes all the time, it’s getting lighter and more options enter the market so check around. My current hiking kit list has now changed completely. 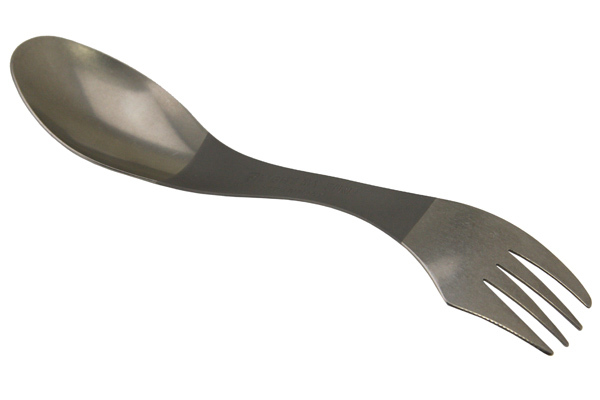 Utensils: Light My Fire Spork (.39 / 11). I used the blade on my pen knife to cut. Cleaning: Cut piece of absorbant cloth & scouring pad: (0.5 / 14) (Not used). Bladder: Nalgene CXC Reservoir 3 litre (5.6 / 160). Gave me the option of carrying 3 litres if I needed it, or anything below that depending on conditions. You should not have to chop and change your clothing for the PCT. Most of what you start with will suffice for all the sections, although you may need to replace some items. I took a t-shirt but didn’t really use it. A long sleeve is better as it keeps the sun off and you can always roll the sleeves up. I wore long trousers but had the option of converting them to shorts with zips around the knees. The only items of clothing that will wear out are socks and perhaps tops as the rucksack rubbing takes its toll on them. I’d recommend long trousers for the desert to keep the sun off. Models with the inclusion of zips at the knees are useful if you want the option of shorts as well. A lighter colour will absorb less heat but show the dirt more. 100% nylon is a good bet. Don’t worry about getting cold if your trousers are light, you can always put your waterproof bottoms over the top as back up. A good idea during the colder sections is a pair of light thermal leggings. I don’t actually bother with trousers now, I use light running shorts, a pair of leggings and some waterproof trousers. These will see you through most of the PCT, keep you dry and warm. I’d recommend wool. It’s way more comfortable and doesn’t retain odours as much as synthetics. Check if there is any stitching, and where it is. Stitching on the heel or on the underside is a bad move; it will rub and cause blisters. Some manufactures make socks with no stitching at all. The only downside to wool is its durability, it does not last particularly well. I did take a spare pair and if I could, washed one pair every evening so it would dry during the day. Washing out the dirt and grit reduces your chances of blisters and prolongs the life of your socks. You have the choice of wool or synthetics. I used wool for my t-shirt, long sleeve top and underwear. It is comfortable, relatively light, keeps you warm when it’s colder and cool when it’s warm. It packs down small but the biggest bonus is that it doesn’t retain odours. When you spend a week walking in clothes, the ability to hang it up for 30 minutes and have something that doesn’t smell is a big bonus. Wool is not that hardwearing however, it can snag easily and rip. Washing is not as bad as you would expect. Some wool clothing advises to wash in a wool detergent only and to dry flat. I never used a proprietary cleaner and tumbled dried on a cool setting with no problems. The advantage with synthetics is that they are cheaper (wool is expensive) and you can reduce your weight. They are also harder wearing. Do not wear cotton. It may be cheap but it’s heavy and if it gets wet it will take ages to dry. Sweat will soak cotton in minutes and if it gets cold, this can be dangerous. Necessary for the colder nights in the desert through to the Sierras. Again, you have a couple of choices here; go with either down or synthetic. Down is a far superior material in my opinion; it is lighter, packs down smaller and is far warmer. Do not get it wet though; if you don’t get it dried quickly it can ruin the garment for ever. Down was a no brainer for me on the PCT, if it’s not going to rain then I’d always use down, and even if it did, you need only wear your waterproof jacket over the top. Insulated jackets are only really worn for camp in the evening and morning. They are far too warm to actually hike in. Some manufacturers are now producing Hydrophobic down which is more resitant to moisture. Synthetics, again, are cheaper and it’s not a problem when they get wet. I would only take a synthetic jacket if there was a fair chance of wet weather. You can pick up synthetic jackets a lot cheaper than down though so this may make the decision for you. Recently, new materials in the synthetic field have brought weights down somewhat and they are a good mix of price and performance. Make sure you buy something which is breathable. Any decent waterproofs should have the ability to breathe and if they don’t, stay away from them. There are still options made from plastic which are really cheap but you will end up getting soaked inside because the body vapour cannot evaporate. Good choices of waterproof material are Gore Tex or Event. All the major manufacturers now have their own in house breathable materials and you can’t go too far wrong if you stick to the well-known brands. Things to look out for on waterproof bottoms are zips up the side above the boots so you can take them off, and put them on without removing your footwear. Some have ventilation options but I never rate these as the chances are, if you’re wearing them it’s raining and you need them enclosed, not open. Elasticated waists or a draw cord are handy to get a good fit, you will find your waist size will probably go down during a hike! Jackets have a host of options that you don’t really need and only add to the weight. Plastic zips are lighter than metal. The cuffs should be adjustable either by a popper or Velcro, or save weight and just get an elasticated cuff. Check the hood doesn’t obscure your vision by dropping down too far over your eyes. Some have a Velcro strap at the back which will pull the brow up and most should have a draw cord either side of the neck to pull the whole hood tighter around your head. Pockets are handy but not really necessary. You should be able to move freely in a jacket, raise your arms over your head, it should move freely and not become tight or restricting. The other, underrated option is a poncho. This covers the body, depending on the brand, down to knee level. It is quick to deploy, if kept in a side pack pocket then you need not even take off your pack. They’re light in their own right, protect your pack contents as well as you and could do away with a pack cover, liner, waterproof jacket and possibly trousers. I didn’t use one on the PCT but now prefer them. I use mine in conjunction with an umbrella. I’d definitely suggest taking a warm hat. Its weight is negligible and you will need one. Again, I find wool more comfortable and warmer but there are numerous synthetic options that may serve you better. I also used a Sahara cap which is basically a baseball cap with a section of material that flops down over the ears and neck, useful for keeping off the sun. Most hikers wear some sort of head protection against the sun. A down balaclava is exceptionally warm but can only really be used when not hiking, they are far too warm to use on the go. Also a must. I used a fleece pair up until Washington where it became wetter where I switched to leather with a fleece lining. Leather does get wet but generally stays warm when it is wet. Alternatively, you could get a warm lining such as fleece again, and buy them with a waterproof outer such as Gore Tex. I have yet to find a pair of waterproof gloves that does actually keeps the water out though. You know what works hopefully because it’s what you normally hike in. You ideally should start in low cut trail shoes (similar to jogging shoes). There is no need for full blown boots in the desert, they are heavy, and your feet will sweat and result in blisters. Low cut trail shoes are lighter and breathe easier with mesh panels, they are also more comfortable. They do not, however, offer ankle protection. I twisted ankles several times in these because there is no support, thankfully every time was nothing serious and your ankles do become much stronger for wearing them. I even used them in the snow in the Sierras, they got wet but the weather was warm enough not to concern me. A great choice for the drier weather would be running shoes, although perhaps the off road varieties. There’s a post I wrote on trail shoes with more information here. I did use boots in Washington purely because the weather turned. Most Gore Tex options should keep your feet dry and you may even encounter snow if you’re late. Again, they are lighter versions than the traditional leather options (I used Inov8 Roclite 288 GTX’s which were ankle length, waterproof and weighed a measly 288 grams each). Expect to get through at least 4 pairs on a PCT thru-hike, maybe more. Low cut trainers wear out much quicker, especially in the desert where the grit abrades footwear quickly. You will probably gain a size in footwear as well so buy as you go, don’t get four pairs at once because they may end up too small for you. There are plenty of shops catering for hikers in the major towns or time it right, figure out when you shoes will be finished and order before on the web for delivery at the next town stop. Try and wear in your first pair, this will reduce blisters or at best, you’ll discover if they’re no good for you. This is obviously not possible with subsequent pairs you buy on trail. Most hikers carried another pair of footwear, or ‘camp shoes’. Being in hiking shoes all day does make you want to remove them at camp. I used Crocs which did all I could ask of them. They are very light, although perhaps a little bulky but they seemed to be the favourite choice of others as well. Failing that a pair of sandals such as Teva’s or similar would work fine. If you’re really stuck for funds then get a pair of insoles and fashion a strap out of Gaffer Tape. Costs virtually nothing and extremely light. Apart from footwear, this is one piece of equipment you don’t want to get wrong. However, as with footwear, you sometimes only find out if a pack isn’t for you until you’ve worn it. I’d suggest whittling your choices down to two, buying one and doing a weeks, or weekends shakedown hike to see if it works. If it’s no good, take it back and get your second choice. Any decent equipment shop should offer a no questions asked returns policy. Size, for a PCT thru-hike you need to aim for around 55 to 70 litre capacity (3356 to 4271 cubic inches). The specs given for capacity will not relate to the main compartment, but will probably take into account any side pockets, rear mesh panels and hip pockets etc. As long as you have a total capacity around this mark you’ll be fine. If you’re unsure, look at something near 70 litres. Or, take your other equipment to the shop and see if it will all fit in. Backpacks are not waterproof. You’ll need a waterproof liner that’s fits in the main compartment, this is essential, not necessarily for the first few weeks on the PCT where it will be dry but once you hit Oregon, and more likely than not, Washington, you may get rained on. Damp gear is no fun, especially down products. 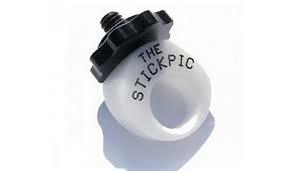 A Ziplock in each hip pocket would be advisable also for the little items you will keep there. Again, you could use a poncho. This is what I used on my hike and I can’t praise it enough. It has everything I need but the big plus is the comfort. I used it straight from the box (despite my previous advice) and never suffered from any rubbing. A popular choice for hikers and I never heard a bad comment about it. Granite Gear packs are sold on comfort. Not so common on the PCT, but on the Appalachian Trail they are seen everywhere. Zpacks have not been around for long but they are manufacturing some extremely lightweight gear. If light is your priority, there is nothing lighter than this as a framed pack. If your pack is over 1.4 kilos, it’s too heavy and you don’t need to be carrying that weight. There are numerous packs well under this weight that will do the same job. 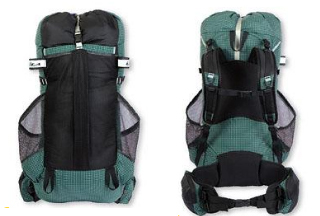 Extras to look for are internal hydration pockets with tube feed, hip pockets are a must for easy to access items, and a rear mesh pocket or similar is handy for items you don’t want to be delving into your pack for. Bend your knees and keep your back straight, hoist it onto your knee, put one arm through the strap and swing it on to your back, then put your other arm through. A packs weight does not sit on your shoulders. Your hips take the brunt of the weight and the hip straps should sit on these. Most manufacturers provide a measurement diagram to ascertain your torso length, which will determine your pack size (S/M/L etc), take note of this. There are two pieces of equipment to consider here; sleeping bag and ground insulation mat / pad. At the start a bag rated down to -7C / 19F is needed because the desert nights can get cold. I found my bag (rated to this exact temperature) was a little too warm for me in both areas but some people sleep warmer than others, some sleep colder. I also changed my bag once out of the Sierras to something cooler, the nights get warmer once you’re out of the mountains. This bag, rated to 0C was about right for me, and I also changed back to my warmer bag during the latter stages. There are other ways of making a bag warmer such as a silk liner but I’d always prefer one dedicated colder bag and a summer option. Apart from temperature rating, the other factor to consider is filling type. As with jackets, you have either down or synthetic. I always go for down for the same reasons as my jacket and on the PCT synthetic isn’t really necessary. Down is lighter, compresses smaller and is warmer. The negative side of having to keep it dry won’t affect you on the PCT except in the last few weeks and then, it just a case of taking care not to get it damp by stowing it in a waterproof bag. Synthetic filling has got lighter and warmer in recent years, but it’s still nowhere near as good as down. It is, however, less expensive if you’re on a tighter budget. You may feel more secure having a synthetic bag during Washington where it may rain. Sleeping bags come in different sizes, usually small, medium and large so check your height before ordering, or better still, try it out in the shop. Some manufacturers specify a left or right hand zip as a preference but it never really bothered me which side this was on. A water resistant outer fabric is handy but does tend to add to the weight. 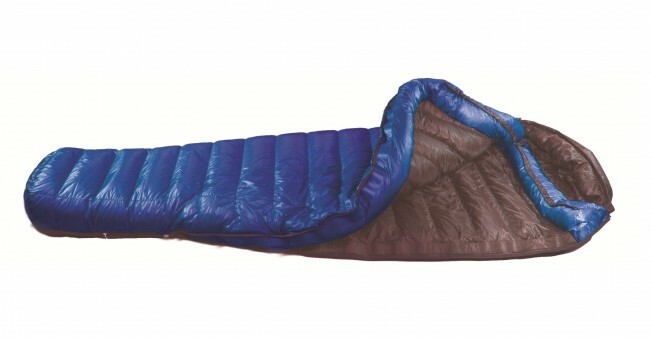 Sleeping bags tend to be quite restrictive, there are models which are designed for those who prefer more room, especially at the feet end but again, you will pay a weight penalty. Most should have a baffle on the body side of the zip, this prevents body heat escaping through this otherwise poorly insulated area. They should have a draw cord around the shoulder and especially the head which can be drawn tighter in colder conditions. Most will come with a stuff sac which is usually useless, pack yours in a waterproof, compressible bag which will protect it and reduce the packed size. Don’t’ store your bag in a stuff sac at home. They should not be compressed during storage at home as they will lose some of their insulation value. Hang them over a rail or in the larger storage bag that some manufacturers provide. Synthetic is easy to wash and dry (it can be done in a Laundromat) which you may find handy on trail, down is more difficult, it has to be dried completely, I would leave this to an expert cleaner. I never washed my bag on the whole trail and it was fine. Take your bag out once you hit camp and let it air. This will enable the insulation to fill out and keep you warmer. Similarly, in the morning, hang it out if you can while you sort yourself, this will let trapped body moisture escape. There is a train of thought that you should not wear clothing in a sleeping bag. Clothing inhibits body warmth heating up the bag. I’m never too sure of this, in the summer it’s not a problem not to wear any clothes but in the coldest section of my hike, I was wearing leggings, socks, a base layer top, down jacket and hat! Mountain Laurel Designs, for one, now offer sleeping quilts which are essentially rectangular in shape but give you the option of wrapping them around to produce a sleeping bag effect. For those, like me, who struggle with the restrictions of a bag, they are a great alternative. Weight: 822 gr / 1lb 13oz (M). This is the bag I used and I couldn’t fault it. Decent weight, tiny pack size and super comfortable. Western Mountaineerings reputation is second to none. A good choice for the lightweights. Mountain equipment is a little heavier than most but they constantly receive good reviews and have a great track record. A little on the heavy side though but remember what I said about synthetic? Mountain hardwear has a good pedigree. Not as low a rating as some but good for warm sleepers. An excellent product from the American cottage industry. The bag I used once the climate was kinder. One of the lightest in its class. Rab’s gear is renowned the world over, built to last and beautifully made. I wouldn’t immediately put Mammut in the lightweight range but this is a surprise for them. Their track record is second to none, you can be assured of a great quality bag. A little on the heavy side but bombproof. It’s no use just sleeping on the ground in your bag. The ground will sap your body heat like nothing else and you will feel it if it is cold, you need to be insulated from it which a ground mat or pad will do as well as providing a degree of comfort from rough or uneven ground. 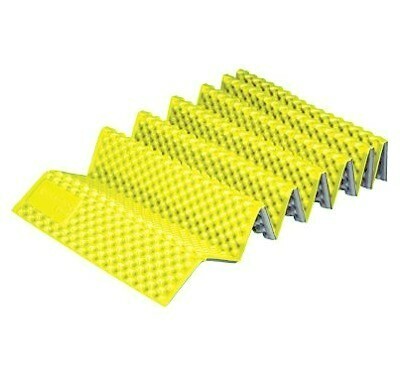 There are essentially two choices, a foam type mat or an in inflating / self inflating variety. Treat anything labelled as ‘self-inflating’ with suspicion, even from the big names. You will need to provide the puff to inflate your pad. Pads are lighter but arguably do not provide as much comfort as an inflating type. They are also much bulkier and will probably take up so much space in your pack that you will need to strap them outside. I have always used the inflating type, the insulating properties and comfort level are higher and I am prepared to sacrifice a modicum of weight for the space issue. That said, there are some inflating versions that are now lighter than some pads. You can go for a full length version or a ¾ length, the theory being that it is only the upper body that needs insulating. Your pack will give you some insulation / comfort for your legs if you use that on the lower half of your body. Also check the ‘R’ rating, this is the indicator of warmth and ability to shield you from the cold ground. Most of the time on the PCT you will be in fairly warm temperatures but may occasionally need to camp on snow. The R value starts at 1.0 up to 9.5, 9.5 being the warmest. As long as you have something above 2.5R this should be fine. A legend in its own right, the Z Lite has been around for a while. It is made from closed cell material (like foam) and has an appearance like an egg box. It’s showing its weight now and it is bulky, perhaps too bulky for the inside of a pack but has a loyal following. Not as warm as most inflating mats but your chances of camping on snow on the PCT would be rare. This was its original name when Karrimor invented and manufactured it. They have now ceased production but numerous companies now offer a basic, foam pad (Gelert and Vango to name two). You’ll find them in any camp store as cheap as chips. Not too great in the comfort stakes but cheap. Weight: Varies according to manufacturer. Thermarest pretty much has the market sewn up but in the last few years other companies have been knocking out some excellent alternatives. It’s super comfy being an unbelievable 2” thick, about as near to a hotel mattress as you’ll get. It’s also not a bad weight. I heard many complaints from users saying they wouldn’t use one because it looked too fragile. I used a NeoAir for my entire PCT thru-hike and it never failed on me once. It also packs down very small. Exped are turning out some well designed and made equipment. This one is no exception and an excellent weight. They have a huge range of insulating mats so if this one isn’t for you, there may be something else. This is my current mat of choice, mainly for its excellent weight. It also boasts a good length and width and is an impressive 2.3/4″ thick. It packs small and above all it’s cheap, making it a great choice. You can read the review I wrote on the Supelite here. There’s a good chance that you could walk the vast majority of the PCT and never get rained on. Indeed, I used to cowboy camp a lot (sleeping in the open with no shelter), but at the beginning, when I was becoming used to California and the PCT I camped most nights because I didn’t cherish the thought of the occasional scorpion, spider or snake cuddling up with me for the night. I would not recommend that you don’t take a tent. It is reassurance, will keep you dry when it does rain, and I did get rained on even in the height of summer. It’s also necessary not just to keep you dry but also for bug protection. 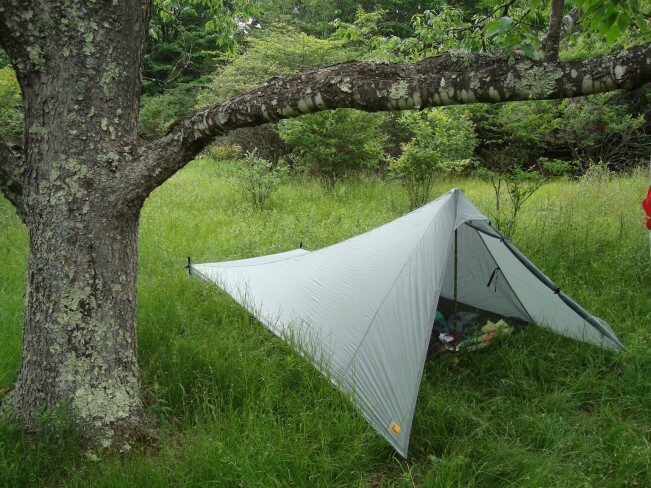 Think of a tarp as a tent without a groundsheet. It’s a lightweight piece of nylon or Cuben Fibre that offers protection against rain only. It’s advantages are the simplicity of the design, it’s quick to erect, offers a small packed size and the weight is substantially reduced. 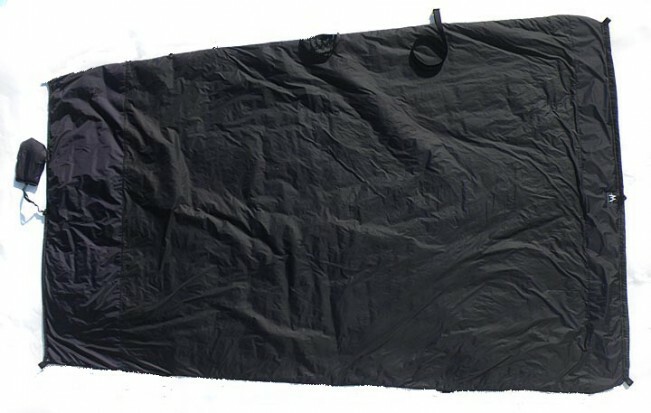 If you want protection for your camping pad against the risk of puncture, consider adding a groundsheet to your tarp or buy a piece of Tyvek (see below). Tyvek has been around as a building material for years but only fairly recently has the camping world got hold of it. It is used to ‘wrap’ houses in as it is waterproof, but breathable, and lightweight. You can cut it to shape and it is cheap. Don’t buy it from a builders merchants, they only sell it in large quantities. Instead, search for a cottage industry camping supplier and they’ll cut it to size for you. Anti Gravity Gear and Zpacks offer Tyvek cut to size. How long have you got?! The list is endless, the manufactures numerous, the specs infinite. Narrow them down to your requirements. Start with sleeping space. If it’s just one person go for a one person tent, or two person etc. Next, look at weight. On person options can weigh as little as 350 grs / 12.3 oz. But this is not the norm. Your one person tent should definitely weigh less than 1 kilo / 2.2 lbs. Ideally, around the 500 gr / 17.6 oz to 800 gr / 28.2 oz mark. Anything more than 1 kilo / 2.2 lbs is arguably unnecessary and you’re carrying more than you need. 2 person options will naturally be heavier, look around the 1 kilo / 2.2 lbs and up mark. You can save weight by buying a shelter which utilises trekking poles as the means of support, as you may be carrying these anyway (and I recommend you do). A porch or vestibule is the area between the inner tent and the fly (outer) sheet. Outside your sleeping area but beneath cover, it is ideal for cooking when it’s raining (although I’m supposed to say here that you shouldn’t cook in, or near your tent). This is fine advice from our friends at Health and Safety, but anyone who’s ever camped in the rain knows this advice gets pushed to the side. It can also be used to keep your dirty shoes overnight and excess gear storage. All in all, a good idea to have one. Don’t forget to seal the areas where the material has been stitched. Believe it or not, tents are not waterproof unless all seams have been sealed by means of a diluted solution of water proof compound. Do this yourself or most cottage industry manufacturers will offer this service for a nominal amount. Seam seal is the stuff you need. A cut to size Tyvek groundsheet is also recommended to go under your tent. Manufacturers standard groundsheets may not be that durable and this will protect them. Dare I say, don’t bother with the big, mainstream producers. These cater for the masses, have features you won’t use, will be far heavier and bulkier and be more expensive. The cottage industry has, and is, producing the best tents for thru-hiking because they understand what we need, the primary concern being low weight. Around for a few years old and showing its weight a little. However, great design, super reliable and steady in winds. This is a twin walled tent (outer waterproof nylon and a further suspended inner). Terra Nova do make lighter versions of this design. Super quick and easy to erect, also a good weight. Uses a trekking pole as the one, main support. A regular on the PCT and I used it myself during the latter stages. Recommended. For the extremists who demand lightweight this should fit the bill. Unusual design which utilises mesh as a floor and one side but I have one of these and it is a great shelter. This is my thru-hiking shelter of choice and you can read why here. 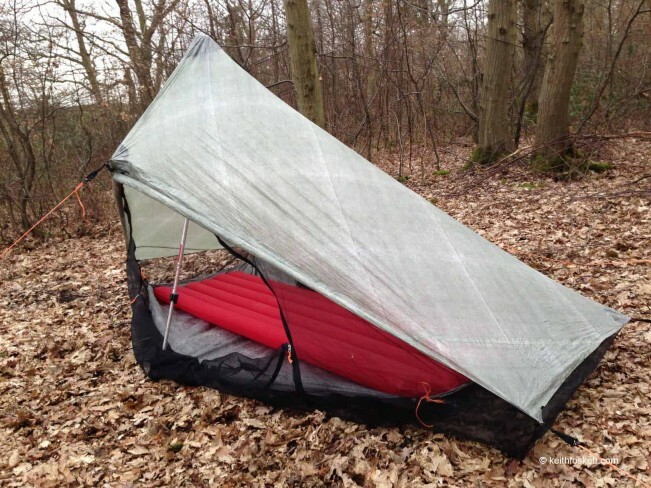 Another mention for Tarptent. Some solo hikers carried this tent as they liked the low weight and enjoyed a little more room. It is great for two people though. MSR tents usually make an appearance somewhere on trail. They’re not the lightest but are very well made and will appeal to those who prefer traditional looking shelters. Don’t be fooled if you think you can get away with not treating your drinking water on trail. Some have done it successfully but I would absolutely not recommend it. There is a lot of some of the purest, wildest water you can drink on the PCT. But, there is also a multitude of nasties lurking in most of the water. Giardia is the biggest culprit, at worst it will end your hike and you will suffer from it possibly for the rest of your life. At best, you’ll be laid up for several days with symptoms that me cringe just thinking about. Believe me, I saw thru-hikers with Giardia, you don’t want it. You can download water reports especially where it may be limited such as in the desert here. A little used but very effective means. I don’t recommend it unless your filter breaks down or similar. It is a very efficient method to treat water, granted, but takes times, used fuel and is well, just completely impractical on the trail. By adding a small amount of certain chemicals to water it can be purified. These can either be drops or tablets. Advantages include simplicity of treatment and the light weight. Disadvantages are that you have to wait, depending on what type you are using, around 20 minutes for the treatment to work. I don’t like this method purely because I don’t like ingesting chemicals although I do carry enough chlorine based tablets to support me for a couple days on trail in case my primary treatment source fails to work. I would recommend you do the same. Chlorine is probably the least effective, somewhat unstable, leaves an aftertaste and has been linked with certain cancers. Household bleach can be used, amazingly, by adding a few drops. Do not used scented, coloured or those with added cleaners. I wouldn’t be comfortable using bleach but it is done. Iodine has been used for a long time to treat suspect water. It is more successful than chlorine based methods but has been linked to certain health issues. I wouldn’t recommend it except as a backup. Aquamira is by far the most common chemical treatment found on trail. It is stored in 2 bottles and mixed together in the cap before adding to the water. When done, screw your water bottle up, then undo a turn until it is not open but the seal is compromised. Turn the bottle upside down and allow a little water to leak out. This will trickle treated water over the opening and threads in case they came into contact with untreated water. Despite a small weight penalty, filtration is by far the most used and preferred method on most trails. It treats water pretty much immediately, given you have to pump a little before you start to fill up your water bottle. This is what I used on my hike, and I’d recommend it to you too. I’ve filtered my hiking water for years and have suffered no ill effects, despite drinking from some very dubious looking and smelling sources. Katadyn is perhaps the best known manufacturer of filters and these were the most popular on the trail. I used their products and can thoroughly recommend them. Mountain Safety Research (MSR) is worth a look also. Filtration involves simply placing a plastic tube in the water source. This will be connected to the inlet valve on the main filter body. An outlet tube will dispense the treated water into whatever receptacle you are using, whether you just dangle the tube in your bottle or connect it via a useful push fit connector. Keep your inlet and outlet hoses separate (one in a plastic bag will suffice) to prevent cross contamination. In general, pay attention when filtering, think about what is coming into contact with dirty water and what is clean, and take precautions to prevent it. My current filter of choice is the Sawyer Squeeze. It’s beautifully simple and requires no pumping. Simple fill your bottle, screw the Sawyer on top and drink straight through. Or, fill up with the supplied water bags and squeeze the dirty water through. Thoroughly recommended, you can read my review of the Squeeze here. The Sawyer Squeeze filter. No pumping required. UV treatment is a fairly recent introduction and in my view, it still needs some work. The theory is brilliant and very effective. However, the equipment used to deliver this technology is still young and I think it needs more work to become more reliable and trustworthy. The introduction of UV light into untreated water disables the reproductive capability of organisms in it. It is very simple, but it is the equipment that is not yet that reliable. There is one main purveyor of UV based equipment and you will either hear excellent reviews about their products, or you’ll get advised to steer well clear. They have a reputation for inconsistency, unreliability and faults. I used one on the PCT and very quickly got rid of it. Basically, when they work they are brilliant, easy, effortless, light and effective. It is the durability and unreliability that needs work. Steripen are the market leaders. There is a lot to be said for gravity filters. Simply, they are a bag, open at one end, funnelling down to the bottom where there is an outlet tube, sometimes with a small shutoff valve. You fill up the bag by dunking it in a stream, lake, or whatever, or fill it by hand. 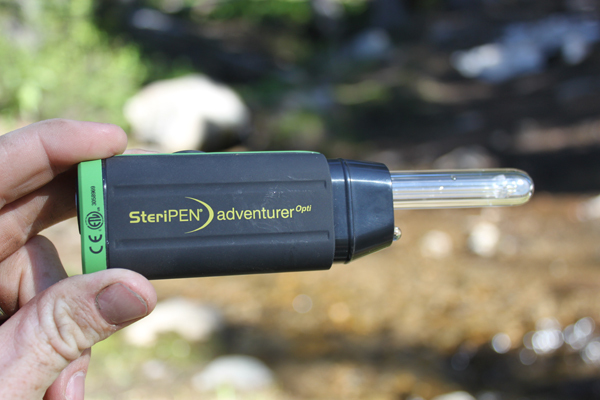 Hang it from a bush or branch and the weight of the water forces itself down, through a filter similar to what is found in handheld filters, and then you simply place your water bottle underneath to catch the flow. They are light, reliable as there are no moving parts to break, cheap, completely effortless, just sit back and watch them perform their magic. All in all, very under rated and worth a look. Some hikers carried hydration bladders which sit inside the pack with a hose that exits and sits somewhere near your mouth. I, too, used this system at the start and it is incredibly convenient. However, it’s heavier than just bottles, every time you need to re-fill it has to be pulled out from your pack and once full again is annoying because it’s too big to squeeze back in against all the other kit. You also never know how much water is left inside so it’s a guessing game as to what you have left without opening your pack. I changed to just a plain old water bottle and kept this in my side mesh pocket of my pack. It’s reachable with one hand and I knew exactly how much I had at a given time, it’s also far cheaper, indeed as with your fuel bottle, you could just use your finished soda bottle. Old Gatorade bottles seemed to be a favourite. I also carried a 2 litre foldable water bag (mine was by Platapus). This I would fill every evening with treated water for camp. It was also essential for extra carrying capacity on the drier, hotter sections. Cooking a meal and a hot drink at the end of the day is a great way to unwind and of course we all have to eat, especially on a thru-hike where calories are burnt quickly. Stoves usually utilise gas, alcohol or wood. Gas is efficient, burns hot and heats food and water quickly. However, cannisters are a little heavy, it’s difficult to gauge how much fuel is left just by shaking them and empty cannisters produce waste. Alcohol burns cleanly, is light because it does not need a canister (a light plastic bottle is all that is needed for storage), and is relatively cheap. It does burn slower than gas so takes longer to heat. Wood is not used often but has a lot going for it. Many stoves can take advantage of burning wood as a fuel source. You obviously don’t have to carry fuel, it is usually readily available and perhaps more eco-friendly, there is also no waste. It is not much use if you are in a damp environment or in areas with little or no wood like the Sierra or parts of the desert. It is also worthwhile taking a pot cosy which you will have to make yourself, very inexpensively. A cosy is made from an insulating, heat reflective material which you cut to size to form a sort of ‘pot’ over your existing pot. I also covered mine completely with Gaffer Tape (Gorilla tape) to protect it and it lasted my entire hike and is still going strong now. Here’s my blog post on pot cosies and how to make one. Boil your water, drop in your meal, remove from the heat and place in your cosy. The residual heat is captured and completes the cooking process, thus saving fuel and weight. I guarantee your food will be piping hot even 15 minutes later and longer. It also means you can cup your pot without burning your hand. Probably one of the newest gas stoves, although a few years old now. Jetboils, as the name suggests, have a fierce heat and thus super quick boil times. They are also very economical, because they heat water quickly, less gas is used and this saves weight. They are a little bulky however but bear in mind that they do have the pot (sort of a large mug), and insulating sleeve as part of the package. A very compact unit that screws onto a conventional gas cylinder. Produces a good heat and quick boil times. Very small, compact and a good weight. Maintains a constant temperature even in cold weather and has a built in ignition. This is the set up I use and I am perhaps a little biased as they sponsored me for my PCT thru-hike. However, it was the set up I wanted to use. It consists of a burner and the cone, essentially a pot stand and wind shield in one unit. Very efficient for an alcohol based unit, compact and extremely light. With certain models it can also use wood as a fuel source and Esbit tablets also. This is a similar unit to the Caldera system, containing everything you need to cook, including the pot. Weighs 161 grs. Worth a look. Anything else not listed above is down to your personal preference and what you can’t live without. Bear in mind everything adds weight and sometimes you will need 2 weeks on the trail to figure your gear is too heavy and subsequently remove some items that you can live without. A spoon is best, a long handled one if you intend to eat a lot of freeze dried meals that are cooked in the pouch. The long handle allows you to get right down to those last morsels in the bottom without getting your hands covered in food. I find plastic spoons tend to snap so titanium, albeit a little expensive, is worth the investment. You really don’t need a blade because you’ll have one on your penknife and you certainly won’t need a fork. Invariably your knife blade may be a little on the short side and those out there who love their spreads, a simple plastic option from somewhere like McDonalds will do the job and weigh nothing. Sporks are a trail favourite. Spoon one end, fork the other. This on is the titanium version. Don’t bother with a plate. Why would you need one? Eat straight from the pot. The choices of pots is endless, some you may need to match up with your stove because some setups are designed to work with a particular pot. If you’re free to pick then titanium is super strong and doesn’t get bent or bashed about, it’s also the lightest but consequently the most expensive. Aluminium is still very light but will lose its shape if you’re not careful. A 1 litre pot should suffice for one person, mine was about 0.9 litres and it was perfect for a hot drink with enough water left over to rehydrate most meals. It follows on that if you’re sharing your meals then a 2 litre unit should be good. 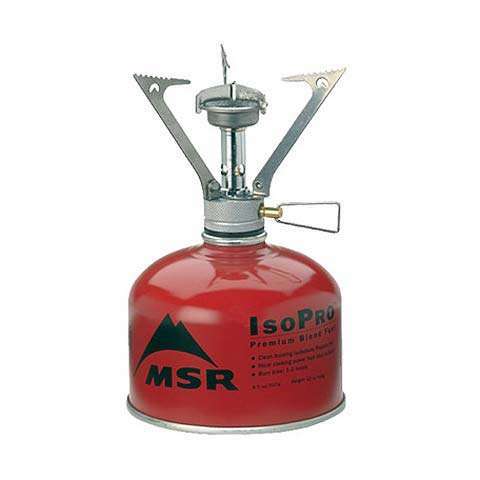 MSR Titan Kettle, a classic one person pot. You’ll need a container to keep your alcohol in. 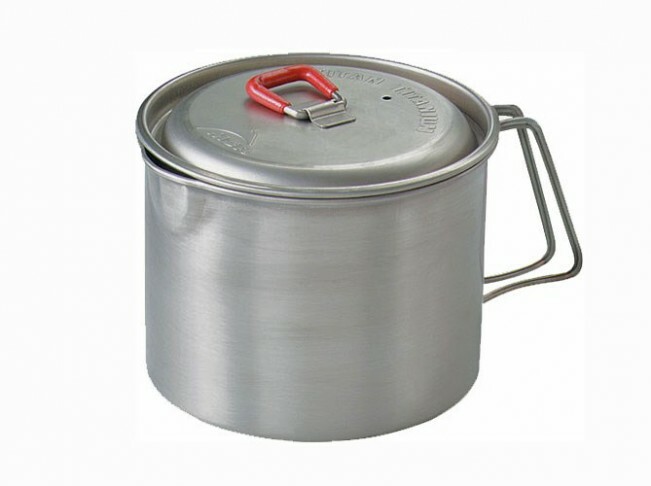 Find out much fuel you need to boil your water, times this by how many days you intend to spend on trail before a re-supply and this will give you your amount and hence container capacity. If you intend to cook at breakfast as well or have the odd hot drink you will need to take this into account. Plastic is usually best for storage, it’s light and inexpensive. 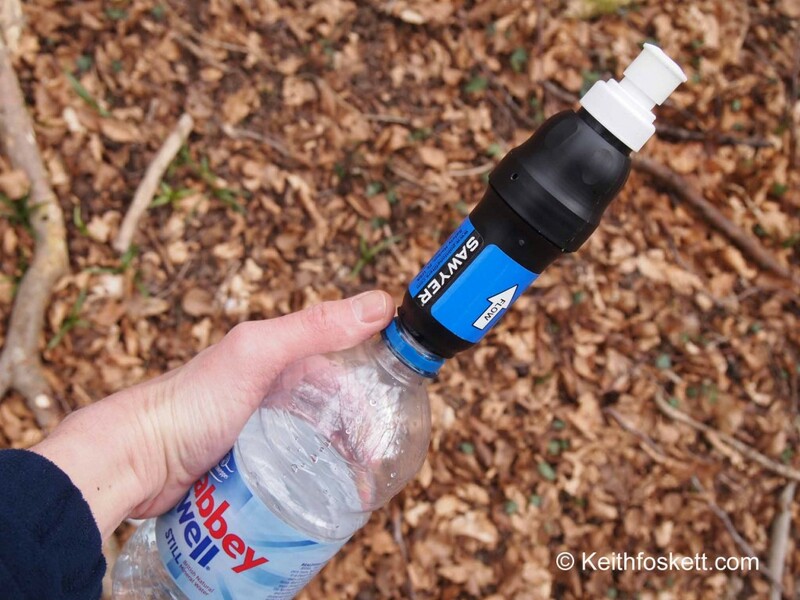 Some hikers even utilise an old drinks bottle. My alcohol set up uses 15ml of fuel to boil around 800ml of water, enough for a hot drink and to rehydrate a meal. So, for a 5 day section I’d take 75ml plus an extra 15ml in case I fancied a cup of tea at lunch. Finally, take a lighter. I used Bic min’s as they were the smallest but I did take 2, always worth having a spare. You don’t need anything else, cleaning wise just stick your longest finger in the pot and run it around, rinse out with some water and bear in mind others will do the same so think twice before eating from someone else’s pot! At town stops I would give it a good wash for the next section. All you need is toilet paper, a toothbrush, toothpaste (get one of the tiny travel tubes), an antiseptic cream that will treat insect bites as well, sunbloc, insect repellent if you need (you’ll still get bitten). I also carried a small pack towel for when I jumped in a lake for a quick clean but don’t bother with soap, shampoo or deodorant. You’ll stink whether you wash or not. Rubbing alcohol is a good idea, especially to treat blisters and it knocks chafing sores on the head quickly; a tiny amount goes a long way. Cordage (about 40’) for hanging your food bag away from bears. You will also have to get a bear canister (www.bearvault.com) for ceratin sections where they are mandatory. A compass is personal preference. The trail is well marked and it is conceivable that you could walk the entire length just using the marked signs. However, concentration does lapse from time to time and before long you’ll stop, wonder whether you’re on the right trail and subsequently backtrack to discover you’ve taken a wrong turn. It is handy for checking occasional directions. A GPS, again, is handy but not really necessary. I used mine but only when I knew I would be walking through snow bound sections, such as the Sierras, where the trail disappears and it is a life saver. Bear in mind with a GPS and other items you’re wondering whether to take or not that someone else will probably have one anyway! A head lamp is a necessity. Leave your hands free to do what they need to do. There are numerous models to choose from, perhaps Petzyl being at the forefront. Forget about the powerful models that will light up your environment for ½ a mile. 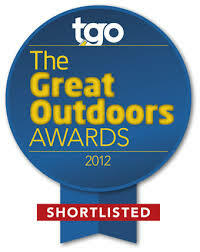 It will just need to provide your light around camp and in your tent, plus the occasional bit of walking at night. Most run off AAA or AA batteries, the smaller versions may only take 6V batteries or CR2032’s which may not be readily available. Some units now power a dedicated pack in the head lamp itself so you need not change batteries but simply re-charge via a USB when in town. Others now take rechargeable AAA or AA batteries as well as non rechargeable so again, you can recharge via a USB. Originally designed to be carried as an emergency, in case your first unit fails, thru-hikers have taken this little model to heart because of its super lightweight, it packs a measly 27 grs including batteries. Not ideal for night walking because of its limited beam distance but if you’re looking to save weight there is nothing better. It does use CR2032 batteries, not so readily available but as they are so light, a spare pair isn’t a hardship. Here’s a blog post I wrote about the E+Lite. This is what I carried. A little heavier (78 grs) but with the security of extra power in case you choose to night hike. There are numerous other Petzyl models in the range looking very similar to this model but with slightly differing functions, they’re all pretty much the same. Petzyl also produce a Tikka R+, Tikka RXP and Nao models that come with the ability to recharge via a USB, no conventional batteries. A very popular brand and reliable. A good, reliable choice. Forget about the ‘Ion’ model, although super light it uses a 6 volt battery unit common in cameras that is not readily available. A better choice would be ‘Cosmo’ model, weighing 90 grs with batteries. Runs on 3 AAA’s batteries, projects a decent beam and boasts a good battery life. The Black Diamond Revolt model uses three standard AAA’s batteries, or if you pop in rechargeable AAA’s, they can be recharged via a USB. It has a variety of uses from sticking on your heels or other blister prone areas. It not only protects your skin but because of its shiny surface, any abrasive areas just slip against it. Use it to cover your pot cosy for protection, use it for repairs. It can repair cuben equipment but doesn’t stick to sil nylon. The roll can be bulky so most thru-hikers wrap some around their trekking poles. I lined my pack with one, main liner made from waterproof nylon. Most rucksacks are not waterproof so you may get away with not having one for a large section of the PCT, but it only takes one spell of rain and your gear will get soaked, especially the down items. If you use a poncho you could get away with not using a pack liner. I also used 3 or 4 smaller bags to keep my clothing, food, sleeping bag and miscellaneous stuff organised. Most options are very light and I thoroughly recommend you use them. You’ll want to capture the experience of a lifetime so take a camera. These are a personal preference so I won’t go into recommendations. Most compact models from reputable manufacturers will take a good photos and video. For HD quality which I recommend most compacts that don’t use AAA or AA batteries but a dedicated battery pack that you will have to re-charge, it would be worth taking a spare or two, especially in cold weather where the charge is drained quickly. If you’re more into your photography take a dedicated DSLR (Digital single lens reflex) which will be heavier and bulkier but reward you with better photos and offer more options to tweak your exposure etc. A good balance would be the compact DSLR’s which have all the features but pack a smaller weight and space penalty. You could even use your Smartphone, many of which such as the iPhone take excellent video and photos. I also used a Stikpic. This nifty device attaches to the end of your trekking pole and mounts your camera so you can take photos of yourself and video. It weighs just a few grams and costs very little. Check out their website for full details. What with your camera, phone, lighting and other equipment, it is unlikely that after charging everything up in town that it will last your next leg. There are various methods of re-charging on the trail. Solar still, in my opinion, is still a little heavy and not ultra relaible but it is getting close. Worth a look are Goal Zero who make some decent stuff. I carried an external battery source that I charged in town and which would hold enough juice to keep me going. Most work on connecting to a USB socket on whatever piece of gear needs charging. Most cameras, phones and now even head torches have USB charging points, it saves carrying a load of different cables. There are a variety of models to choose from but try and get one with a decent output, measured in mAh. The higher the mAh the quicker it will charge and more power it will hold. A 6,000 mAh for example may only charge an iPhone 3 times, whereas a 14,000 mAh may give you 6. The higher the mAh, the heavier it will be but I’d recommend something around 10,000 mAh for the PCT. Obviously it depends on how much you use your phone. I carried a model of theirs on the Appalachian Trail and have just purchased another for my Continental Divide Hike. No complaints. 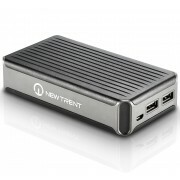 New Trent PowerPak+. 13500 mAh, 283 gr and only around £28 / $45. Another company supplying good products. You may want to take a look at Brunton, who are producing alternative ways to power your devices with the likes of hydrogen. They also offer solar equipment. Unless you’re very careful with your eyewear, buy something cheap but with good UV protection. Equipment gets trashed on the trail and you will probably end up either leaving them somewhere or sitting on them. A definite necessity, especially in the snow bound sections. My last attempt at getting gear sponsorship was way back in 1994 when I did a 6 month cycle tour with a mate. We got a few freebies but it taught me some lessons on how to approach companies. As it turned out I did pretty well for the PCT; I scored all my footwear through Inov8, a camera from Olympus, a lot of clothing including socks from Smartwool, hydration equipment from Nalgene and cooking equipment from Trail Designs. This totalled about £1100 / $1650 which naturally I was chuffed to bits with and more importantly, saved me a shed load of money which meant I had more funds available for the hike and therefore, I had more chance of success. Remember, I did this on a first attempt. So, how did I do it and can you do the same? The ‘how’ is explained below and yes, you certainly can do the same! Let’s assume you haven’t done a thru-hike, haven’t got any gear and need to save as much money as possible. What amount are we talking? (Please assume these are average prices. Yes, I’m sure you can maybe get them cheaper and my friends in the States will probably get them even cheaper than that). There is also insurance and flights which if you’re flying to the States from Europe could easily nip in and swipe another £1000 / $1500 from the bank account. It’s a lot of money isn’t it? Certainly it could be make or break for actually being able to go and do a thru-hike or not. OK, so I’m not suggesting you are going to get all of this gear supplied for free, that would be pushing it but, even if you scored your footwear that’s a potential to save a huge £400 / $600, which would mean well over a months’ worth of expenses (motels, food etc.) whilst you are actually on trail. You only need to use email for contacting companies, don’t bother with calling them apart from the advice in the next paragraph if you want to use it. Phone calls for sponsorship take time and are ineffective, email can be tailored to each piece of gear you need, the wording and pitch can be honed to sound great and emails are free. However, a quick call to find out who deals with sponsorship is worth the effort so you at least know it’s going to the right person, get their email address as well. This is a closed question, it puts the person on the end of the phone in a position where they feel they cannot answer yes or no but need to give you a name. You should get the name just with this question. If they ask who’s calling just give your name. If they ask for a company name say there isn’t one. If they say they aren’t doing any more sponsorship this year say it’s fine but you still would like the name please. Some receptionists believe that their very existence on this planet relies on them being as awkward as is humanly possible and not providing information under any circumstances. Be polite, hold you ground and you should get a name. If you really try and can’t get any info, just leave it as it’s not the end of the world. Send them an email if you prefer and just ask the same question, it may take longer though. You are going to put in effort to get sponsorship, you may as well make sure it gets to the right person. This sounds obvious but a little time spent looking around the contact area of a company’s website (which is nearly always found at the bottom of a webpage) will result in a ‘Sponsorship’ email address, maybe even a name. Requests sent to general enquiries or some other department will at best take a while to be re-directed, or at worst, just get ignored. Get it to the right place. Hiking for half a year on no calories. Or 360 packs of Ramen isn’t going to do it. You only get one shot, make sure you use it. OK, so you’ve got the right person, the correct email address, and you’ve got their curiosity. They’ve opened your email, now you have to be original, funny helps, cocky if you’re careful and you need to grab their attention quickly, these people are busy and it’s their job to dispense with as many requests as possible unless they like you. Sure, gear companies require a lot of things such as exposure in return but if they like you, if you can even make them laugh, you really have done most of the work. Be as brief as possible but provide the information they need. It’s about educating them to your needs in as short a script as possible. They get thousands of requests each year, you need to stand out and you need to stand out quickly. 1) Firstly, be specific. Don’t say I need a tent, state exactly what you need. I need a seam sealed Tarptent Contrail with yellow, reflective spectra cord guy lines, integrated line tighteners and titanium tent pegs. This makes you sound professional because you know exactly what you need and not just someone who’s making a half arsed attempt to do a thru-hike (or whatever activity). I’m going to hike 2,640 miles on the Pacific Crest Trail. 3) Make your trip sound immense and a true hardship, they love all that stuff. It mixes remote desert with high altitude mountain ranges, intense heat and bitter cold. 4) Explain why you need the item you’re asking for and make them feel good by saying you think their product is the best. I will be camping for 95% of the trip and need a tent I can rely on. Your product consistently scores brilliantly in reviews and my friends recommend you as a company. You are my first choice. 5) If you’re raising money for a charity include that as well. You should, and could, be able to do all that in a maximum of 300 words, make it less if you can. Don’t put it rubbish that’s not needed, if your message is 150 words and you’ve included the above points and stated your case, then 150 words is enough. Gear companies are after one thing from sponsorship and one thing only – Exposure. The more their brand is out there on the trail, or seen on an athletics track, or on the wings of a plane the better. The more exposure they get, the more products they sell and the more money they make. Tell them how you can do this. Tell them what you can do for them. If you haven’t received sponsorship before the exposure you can offer will probably be limited, but you can still make it, and you sound good. However, the one, main action you can do to put events in your favour is to start a blog. Do this a good month minimum, 3 if you can before you approach sponsors and put as many decent posts on there as you can. Make it look professional and make it look like it has been going for 2 years. Put in reviews on stuff you already own with good photos. Put in some trips you have done, post some comments about anything you like, make it interesting. Tell them you will put their logo on the site in a prominent position and that you will write a post about their gear. If you have some gear already then write a review of it and put that company’s logo on the blog, just because you don’t get sponsored by someone doesn’t mean you can’t put their logo on your site, it looks professional and makes people think you are sponsored by them. Tell them you plan to video the event and will post on YouTube and that you will get their gear in the shot. If you’re going to write books then tell them this also. I won’t lie to you, first time sponsorship if you have little hiking experience isn’t easy but it is not impossible as I proved with my first big hike on the PCT. 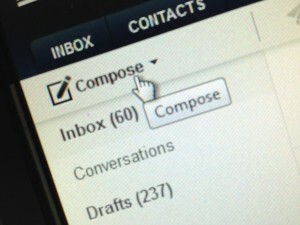 Remember, keep your email as short as possible, between 150 to 300 words. You have limited time to make an impact, they have little time to read requests and if they open your email and it has 3,000 words they will lose interest before they even start to read it. The 3 P’s – Polite Persistent Pestering. This is important, perhaps the most important point of all. You’ve done the hard work, you’ve got the email to the right person, you’ve thought of a good title and you’ve composed a good pitch. Now, this is where you will score points if you put in the effort and stay with it. I sent you an email on 12th March (there is a copy below). I realise you are probably busy but I was just wondering if you managed to take a look at it? Wait another week (because you still probably won’t have had a reply) and send another reminder using a similar format. I refer to this process as ‘Polite persistent, pestering’. Keep doing this until you get a reply. Remember, you are not bothering these people. You are doing them a favour as well; you are offering to promote their stuff. Do not give up under any circumstances. You are not being rude; you are not being annoying. Even if you were, you’ll probably never meet the person on the other end so why worry? Your objective is to get a reply. Eventually the person will answer you to try and make you go away; it’s an answer you need, even if it’s a ‘No’ it doesn’t matter as all is not lost with a ‘No’. Most manufacturers assume sponsor requests go away if they don’t respond. It will probably be a stock response telling you their sponsorship budget for that year has been reached or they have cut back due to the financial climate. OK, so eventually you will get a reply. Obviously it’s a either a yes or a no. Chances are it’s probably a ‘No’. If so, do not give up. Send a polite response again, thank them for replying and ask if they would be at least prepared to offer you goods at trade price which is often at least 50% off the RRP. This can produce excellent results and at this point they will probably entertain any idea to get rid of you. If the answer is yes – great! Treat any sponsors like gold dust and build a relationship with them. Extoll their products; send them the occasional email telling them how you’re getting on. Build a good understanding and they will look after you if they think they’re getting a good return on their investment. I send my sponsors postcards from the trail, it’s a nice touch and they’ll remember you for it. Be loyal, if you’ve scored the pack you need then why change it? If they like what you’re doing for them the chances are that when you need another one they’ll help you out. You’ve done the hard work getting them on board, it makes sense to look after them. “If you would like to join the companies who already support me like Olympus, The North Face and EatMe Trail Foods . . .” etc. This lets them know that someone had faith in you and saw potential, maybe they should as well. The most talked about topic on trial. Apart from water it is the only other absolute necessity for your hike. You’ll be amazed at how much weight and space a weeks’ worth of food will take up but there’s little you can do about it. It is hopefully obvious to you that weight is paramount here. You have to supply breakfast, lunch, dinner and snacks. Carbohydrates are the most important as they provide your energy but don’t forget proteins and fats which are also crucial. Once you’ve walked for a couple of hundred miles you will soon realise what you’ll crave, what you can’t stand and adjust your re-supply accordingly. Most thru-hikers re-supply in town every week or so, this is how I did and would recommend you do the same. The other option is mail drops where you buy all or most of your supplies in advance and send them up trail via the postal service to be collected as you move on. You can save a lot of money because you’re buying in bulk but remember that you will also be paying postage, perhaps around £6.00 / $10.00 for every drop, and on the basis of one a week, that could work out at £144.00 / $240.00. It’s not for everyone but is important if you have dietary restrictions (vegetarian, intolerances to some food groups etc). A re-supply in town will mean ‘decanting’ your food stuffs into Ziplock bags. This gets rid of unwanted packaging, and weight, and prevents food spillage. It also means you can add ingredients to others, for example some chilli powder to your soups, sugar in your granola etc. Breakfast consisted of oats or granola to which I added some sugar, powdered milk, dried fruit and nuts. Oats, apart from being good for you, release their energy slowly so you stay full for longer, they are also light. I usually had a cup of tea of coffee with this. Lunch I used flour tortillas which take up far less room than bread and are less perishable. I mixed the fillings according to my moods but regulars were peanut butter, tuna, dried meats such as salami because they keep well, and Nutella or jams. Dinner was a dehydrated meal which you will need to increase your calorie intake. The offerings from some reputable hiker dedicated meal companies tend to be very expensive. I used them on occasion as a treat but my dinners usually were a simple flavoured rice packet which I added possibly some parmesan powder, or salami, or olive oil etc. Other times I ate pasta (use the smaller shapes like Macaroni tubes, they’re quicker to cook). Products such as Knorr Sides are tasty, filling and can be obtained for 70p / $1.00. Ramen Noodles are also very cheap but beware they have a high salt content and I found I needed two packets for one meal. Experiment, take a variety at first and whittle them down to what you like over the first, few weeks. Then take some extras such as meat and cheese to bulk them out. A seed mix sprinkled on top (sunflower / sesame / pumpkin) will boost your nutrients also. My snacks I tried to keep healthy and boost my fat intake. Nuts are ideal, dried fruit is good (but little fat), and I took crunchy, oat based bars for my breaks. Sweets (Candy) don’t really give you much more than a sugar rush but I found I craved them. Listen to your body and you won’t go far wrong; If you’re craving lettuce smothered in peanut butter or hot chocolate then you’re body is trying to tell you something. Fruit and veg are difficult to take on trail because they perish easily and get damaged, as well as being heavier. I did take a couple of days’ worth of fruit though, usually a couple of bananas, an apple, and maybe a pepper with a small onion. The harder fruit and veg tend to last better than the softer ones. I also used a protein shake during the latter stages of my hike. Mixed with water it packs a powerful punch of much needed protein, essential for body repair. I used to have this with an oat bar for breakfast which saved me cooking and thus saved weight in using less fuel. In town, top up your fat. This is the one component difficult to eat on trail because it tends to be the heaviest but discount it at your peril. Fat is lost at an alarming rate on a thru-hike and must be replaced. Drench you salads in good oil such as olive, even a hamburger and chips, which receive disapproving frowns from the nutritional experts can often be the fastest, easiest and cheapest way to stock up on fat. Also try and take advantage of town stops for your fruit and veg which can also be neglected. The compounds, minerals and nutrients found in fresh fruit and vegetables are necessary for your body to perform well. Powders can be mized in with your water to add flavour but more importantly, can provide you with much needed salt and minerals lost in the heat. I used EmergenC sachets which I recommend. During desert stages and when really hot, it is paramount to replace salts and minerals. You’ll experience extremes of heat, cold, sun and rain on a PCT thru-hike. Being prepared will smooth your passage. The deserts of southern California are scorching during the day but cold at night. The climate cools in the Sierra but it can still get chilly at night. Once out of the mountains the rest of California and most of Oregon will be warm with very little rain whereas Washington can be wet. Cover up (long sleeved tops and trousers) in the desert and a hat to prevent getting burnt, although once your skin has acclimatised it copes remarkably well. Carry cold weather clothing for the nights and mountains. The heat, thankfully, is dry. Humidity is very low all through the PCT so although hot, you should be able to deal with it. The snow sections of the Sierras are still warm during the day but keep your warmer winter sleeping bag with you until you come out, then you should be OK with a summer bag. You ideally should carry an ice axe (and learn how to use it) through the mountains and a pair of lightweight spikes for your footwear such as Kahtoola Micro Spikes (a lightweight version of crampons). Rope is not necessary. Cold weather gear is best sent to Kennedy Meadows to be collected for the mountain section, you can ditch it after that. You may get snow over Fuller Ridge in southern California near Idyllwild, your first encounter. Depending on how severe the winter was, it may be worth sending your snow gear here first. Once out of the Sierras, the climate stays warm through the rest of California and Oregon. Washington can go either way but you will probably get rained on here at some point. There are no injections required prior to departure for the PCT, not even malaria. However, the best advice I can give is to check with your doctor or the numerous online health advice websites. Your doctor, for example, may recommend you get a tetanus boost. If you have a specific condition, make sure you take enough medication for your trip, drugs and medical treatment in the USA is expensive. Carry your medication in the box it came, do not decant into a ziplock or similar or customs may pull it over. Make sure you carry travel insurance for this reason as well and that the medical cover is adequate. UK citizens do not get free medical care in the States and healthcare is incredibly expensive over there. Also let them kow what you are doing and how high you will hike or they may not cover you for something like altitude sickness. I took a multi vitamin every day and an iron tablet as I have a minor iron deficiency problem. 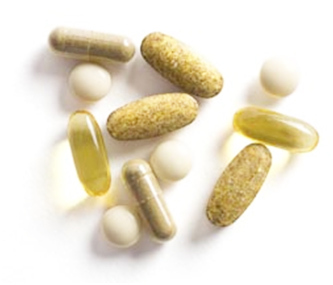 A multi vitamin is useful because of your limited food variety. Start your hike slowly and build up to allow your body time to get used to what you are asking of it. Do 10 miles for a couple of days, up this to 15 for a couple of weeks and then find your limits. Most thru-hikers pull in around 20 to 25 mile days. Start too quickly or cover too much distance early on and you risk injury. A small first aid kit is advisable. All I took was painkillers for those long days, some antiseptic cream that doubled as a bite relief from insects, a few plasters and some rubbing alcohol. Many hikers advocate stretching. Although I never bothered there a lot of pros to be said for stretching down those muscles at the end of the day. There’s a lot of advice out there concerning blisters. I used to cut away the top skin, apply rubbing alcohol but I always left them open to heal in the air, make sure you clean them as best you can at days end. It’s not the blister that should cause you problems, but the infection if you don’t treat them correctly. Water borne parasites, bacteria and viruses can end a thru-hike. The worst culprit is Giardia which I have mentioned, present in the water so make sure you have treated it correctly. The drug for this condition, Flagyl (amongst others), is expensive. In America, due to some dubious regulation, you cannot get Flagyl unless you actually have contracted Giardia. Not much use if you’re in the High Sierra, 5 days walk from the nearest town. I had my GP in England prescribe me this before I went which he did obligingly, and kept it with me just in case I, or indeed, someone else fell foul. It would be well worth you doing the same. Keep the packaging on any drugs. If you decant them before you enter the USA, you will have to prove what they are or get them confiscated. Empty into Ziplocks when you get there and mail ahead of you to collect as you progress. Sunblock is paramount, at least until your skin becomes used the sun. Insect repellent is a choice many take but you will probably still get bitten. Beware of altitude sickness in the High Sierra (also known as altitude cerebral edema; Altitude anoxia; Altitude sickness; Mountain sickness; or high altitude pulmonary edema). Make sure you research the condition, know the signs and what to do. Simply, it can kick in as low as 2000 metres and above and is a result of reduced air pressure and lower oxygen levels. Difficulty sleeping, dizziness or light-headedness, fatigue, headache, loss of appetite, nausea or vomiting, rapid pulse (heart rate), and shortness of breath with exertion. If you feel you may be suffering from AMS, the fastest, simplest and quickest way to relieve the situation is to lose altitude, i.e. climb down until your symptoms subside and stay there for a day. Remember also to climb the mountain gradually, stop for a day or two of rest for every 2,000 feet (600 meters) above 8,000 feet (2,400 meters), and sleep at a lower altitude when possible. This advice would be more applicable to section hikers who go straight to somewhere like the Sierras and start there. A thru-hiker would have spent several weeks slowly gaining altitude and should be in a better position to cope with altitude. However, even thru-hikers note that AMS can strike anyone, no matter how fit they are or how long they have spent aclimatising. Remember you can’t always call the emergency services on the PCT because chances are you will not have a signal to do so. Walk with others if you feel insecure. A bounce box is a package that you send up ahead of yourself to a town where you intend to stop, perhaps for a re-supply. It contains items that you need but use infrequently so don’t want to carry them all the time. Such examples would be battery chargers for your phone, camera chargers, spare food you didn’t want to throw away, medication for the coming months, spare journals, spare pens, perhaps shaving equipment. Some hikers even kept a laptop in them. I’d say 95% of the hikers I met had a bounce box. The USPS has an assortment of various shapes and sizes of boxes that have a flat rate, perhaps $10 depending on the size, regardless of the weight. Pack your stuff in what size you need, mail it up trail, collect it, use what you need, re-pack, re-address it and send it off again. Post offices will keep your parcel until you collect it but you should give them an idea of arrival time and also make sure it is addressed correctly. Mark it ‘General Delivery’ which lets them know they need to hold onto it until you arrive. Most trail post offices are used to PCT hikers so they know the score but make their job a little easier and label it clearly with all the information they will need. You can also send packages to some trail angels and other establishments who may hold it for you (trail angels are those who give up their time to provide a service to thru-hikers, often for free although donations are welcome. It may be food by a road crossing or free accommodation). Make sure you try not to arrive in town to pick up your box on a Sunday, the post offices are usually closed. 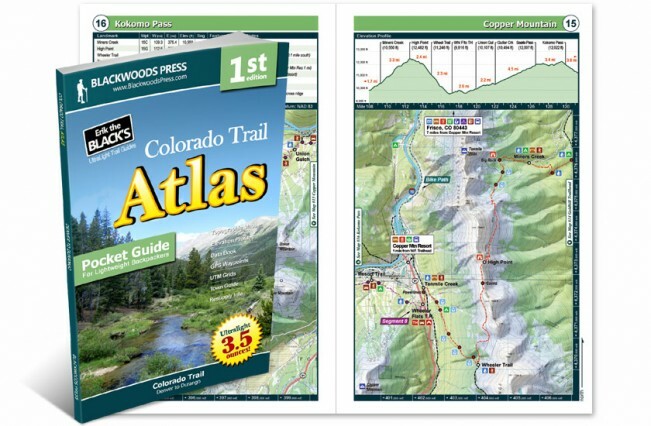 The PCT Atlas (see below) provides details of the major towns, whether they have a post office, the address and opening towns as well a map. If you do not need to open your box for whatever reason, the USPS will send it onto another address at no extra charge. You could conceivably walk the entire PCT with no maps. However, a map, of even better, a guide, should make your journey easier. If you’re unsure which split the trail takes a map can get you out of trouble. It’s also a good source of information of what’s coming up, where the water is, where to get off trail to town. Another excellent choice, also providing other useful info as well as just mapping. Halfmile’s trail name came about because when he walked the PCT, he stopped about once every half mile to take a GPS reading and subsequently produced his online maps. The great plus point is that they are free and many hikers love them. Print them off and take the relevant section with you. Yogi is well known in PCT circles and her guidbook pretty popular. Well worth a look. Download the entire trail data from one of the numerous companies such as Garmin or Magellan. It is, however, an expensive way to do it, your need to carry a GPS unit which although is not exactly heavy, is not exactly light either. You also need to make sure you have spare batteries. Look around the net as well, many individuals will let you download the routes they waymarked for free, or for a small donation. There is an abundance of creatures native to the west side of America, and the PCT. Experiencing animals such as Elk, Marmots, deer and birds like Eagles will make you feel privileged. The vast proportion of wildlife on the PCT is completely harmless and even the ones that could pose a threat are rarely encountered. If you know what you’re dealing with you can better prepare yourself for the situation. This is sobering reading but console yourself with the fact that attacks, bites or any dangerous encounters on the PCT are very, very rare. The following is advice generally accepted as the best way to react to animal encounters but it is, only a guide. There are numerous species of snake which would take far long to detail but the one most common is the Rattlesnake. 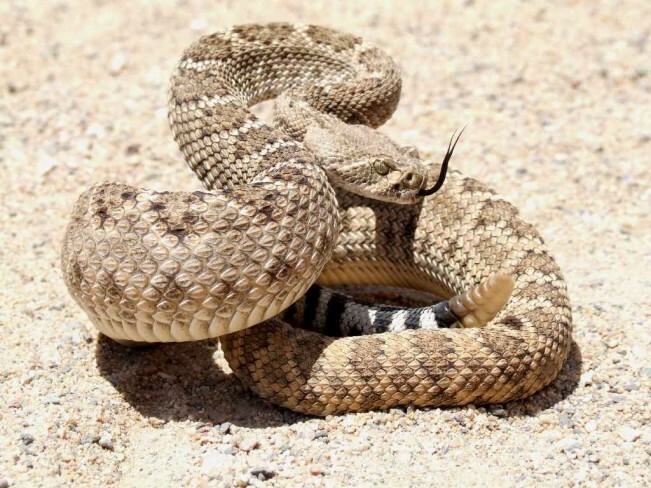 Not just one variety but several: Northern Pacific rattlesnake (in northern California), the Western Diamondback, Sidewinder, Speckled rattlesnake, Red Diamond rattlesnake, Southern Pacific, Great Basin rattlesnake and the Mojave rattlesnake. Rattlesnakes are good to you, they normally let you know you’re getting too close by simply rattling. Give them a wide berth and you’ll be fine. I don’t like snakes but gained a healthy respect for them – leave them alone and they’ll leave you alone. Research what to do if you should get bitten. Advice is numerous, some say wash the wound, remove anything that may constrict swelling such as a watch or bracelet, and get to the nearest medical facility, or call for help. The important thing that most agree on, bizarre as it may sound, is to stay calm. If you panic, your heart rate increases and the poison is delivered around the body quickly. Stay calm, lie or sit down, preferably keeping the wound above the heart, call for help or if you have no reception, get someone to get help as quickly as possible. This is easier said than done in remote locations but as a thru-hiker, there is little you can do if you get bitten. Snake anti venom kits can be carried but I met no hiker that had one, purely because of the added weight and the slim chance that it would be utilised. Approved bear canisters are required in parts of Sequoia and Kings Canyon National Parks, Inyo and Sierra National Forests and in all of Yosemite National Park. See the PCTA website for further details. I used a Bearvault, as did many others. There are other brands and options available, you should probably be able to get a used one with a little hunting about on associated forums, a good idea bearing in mind you won’t be using for long and subsequently be able to sell it pretty easily as well. A bear cannister is essentially a large plastic container to which a bear cannot either break into or or open. 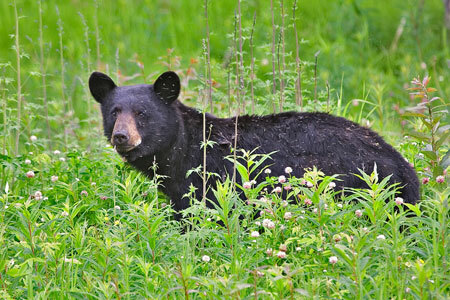 You should leave it away from camp, downwind, so bears are not attracted to your camping area and store your food, anything smelling of food and toiletries as well. 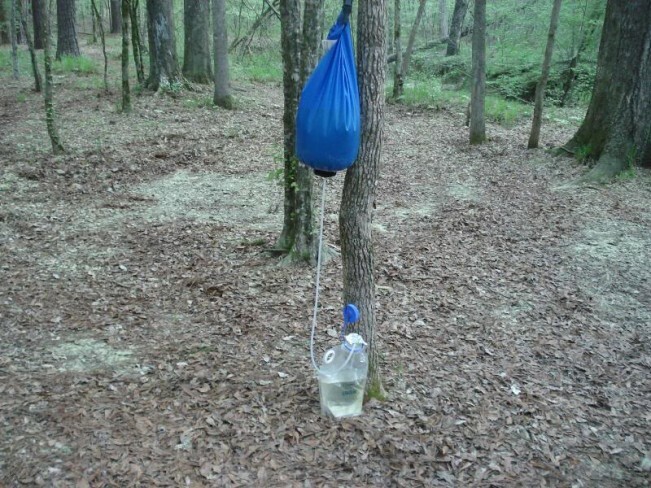 The other option, outside areas where canisters must be used, is to hang your food in a bag up a tree. This takes some practice but obtain some lightweight cord, about 40 feet long. Tie one end to your food bag, the other around a stone or heavy object. Throw the stone end over a branch so it falls back to you and then secure around another tree or stationary object. Hoist the bag up to a height of around 12 feet, make sure it is 6 feet down from the hanging branch, and 6 feet away from the trunk. This should ensure it is out of reach from all angles. Again, this should be done downwind and away from your actual camping area. There’s an excellent illustration of how to do this here. Paul Turner at Take Outdoors has a great page dedicated to bear information HERE. Sometimes known as cougers, mountains lions are pretty rare, keep themselves to themselves and you would be very privileged to encounter one. I know of only of one other hiker who caught a brief glimpse during my thru-hike. Encounters are rare, attacks even rarer and fatalities from such attacks even rarer than that. One report states that between 1890 and 2004 there were 88 attacks resulting in 20 deaths on humans in the USA, that’s an average of less than one attack a year. Looking a little similar to a domestic cat, mountain lions can grow to the size of a human. They are predators, creeping close to prey and then attacking swiftly. We are not normally on their preferred choice of foods but children are more at risk, albeit a very tiny risk. There’s not much you can do in the rare event of an attack, defend yourself as best you can. Mainly found in the desert section of the PCT, but they have become adept at making most habitats their home. These are nocturnal creatures; you may encounter them at night, during the day they hide under stones, rocks or in holes. Most scorpion stings are harmless, although can be very painful. Stings can result in malaise, sweating, heart palpitations, rise in blood pressure, salivation, nausea, vomiting and diarrhoea. In these cases it is best to get to a doctor, make an emergency call or get someone to go for help. Remember; shake your shoes out in the morning! There are a variety of spiders you could encounter on the PCT but again, you won’t see many, if at all. The most common are the Black Widow, Brown Recluse and Tarantula. A stinging, slightly smarting pain is often felt at the site of the bite. The pain can sometimes be burning and violent. In some cases, there’s no immediate pain, but instead it comes on after 30 to 60 minutes. Blistering, bleeding under the skin and a convulsive sensation in the muscles may be felt. Later, local tissue death may occur, but this depends on the venom concerned. Most PCT thru-hikers start at the Mexican border and head north. This usually offers more time for your hike because you can start earlier, usually around the end of April. This is considered to be the optimum start time taking into account receding snow levels around Fuller Ridge and the Sierras. There is the chance to walk with many others, to experience the Kick Off party at lake Morena and because most hikers are chomping at the bit to get going and cannot face waiting for another couple of months to attempt a south bound hike. It’s your own choice but I’d recommend walking south to north. South bounders typically start around June, the snow in Washington takes longer to melt because the latitude is further north and therefore doesn’t warm up until later. The advantage of south bounding is that you are not in a game of chase with the weather. You need to get to Canada, if you’re north bounding ideally by the end of September to avoid snowfall. After this, into October and you’re playing a risky game as I discovered. If you start at Canada and head south, you are walking into warmer weather which is peace of mind but remember snow hits the Sierras earlier than anywhere else so you should aim to get through this section as soon as is possible, certainly by the end of September again. 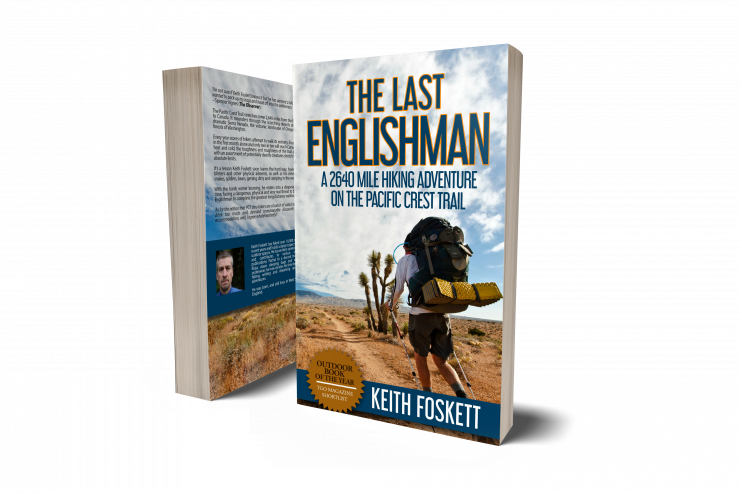 The Pacific Crest Trail is possibly a once in a lifetime opportunity. It is an amazing escape, you will be free to live for six months with little constraints in pristine wilderness. I know of no hikers that I met that didn’t enjoy it, despite some rough days they would all do it again, myself included. Use the weeks before your hike to increase your fitness levels, go for a run or better still takes lots of walks. Test your equipment and become familiar with it, break in your footwear. Most thru-hikes fail in the first month. This is because it is the hardest section, you’re not as fit as you possibly should be, your equipment is not worn in and rubbing you, blisters will appear and you may wonder what you have let yourself in for. I always say this, but if you can get through the first month then you will probably make it as a thru-hiker. Be strong in your mind, don’t let the hardships get you down, if you have a bad day then tomorrow will be better. If it hurts do your best to ignore it and battle on. Deal with the hardships psychologically and you will make it. Never, ever, ever quit.